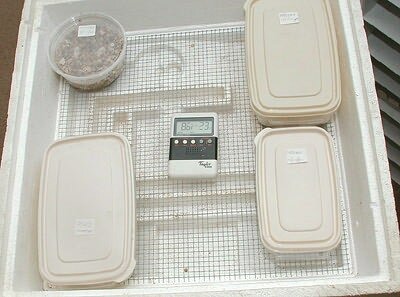 Many of our customers have asked me the correct way to incubate their eggs for the most successful hatch rate. There are many ways to do this, but this is the method that we use. 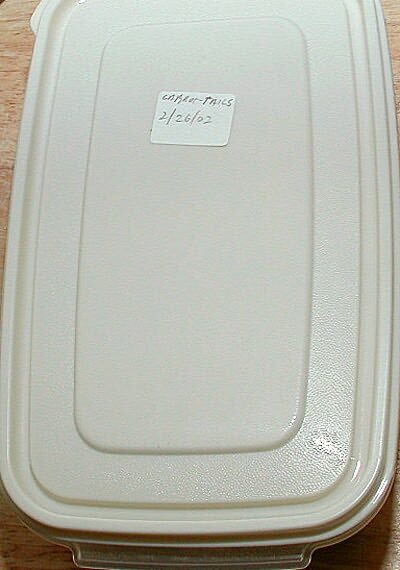 We incubate our eggs in a 24 OZ Rubbermaid servin’ saver. They are rectangular in shape, and are 4 ½ inches wide by 7 ½ inches long. 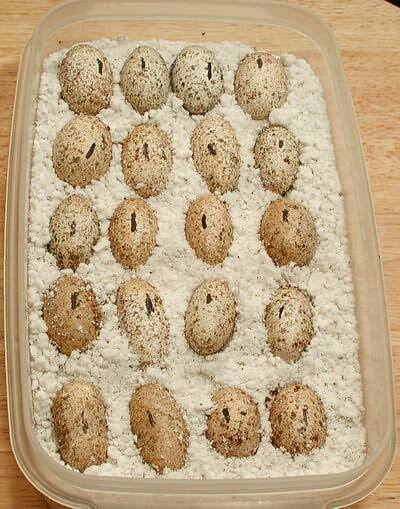 You will be able to incubate 20 eggs in one by way of 4 across, and 5 deep. The picture below shows what you are striving for. It sure is pretty, isn’t it? 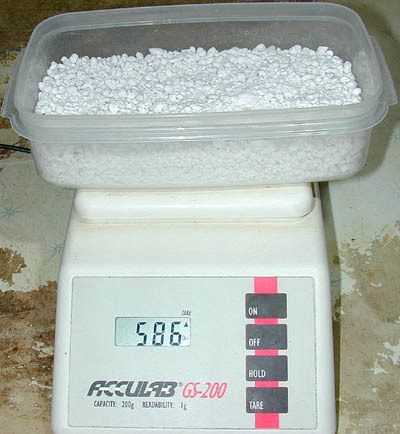 As you can see from this picture, we use Perlite as an incubation medium. You can also see that there are no air holes in the servin’ saver. We will go into more of that later. 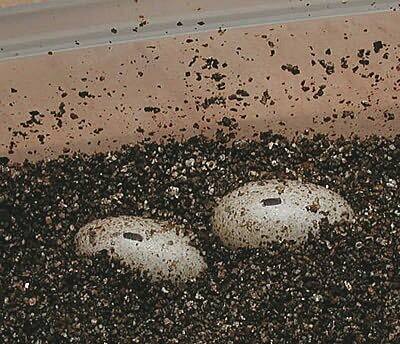 If you are wondering why the eggs are all dirty looking, it is because we use moist Vermiculite in all of our egg laying chambers. We have found it to be the best lay-box medium. The next thing we need to do is figure out the proper way to provide the right amount of humidity for the eggs to hatch in. 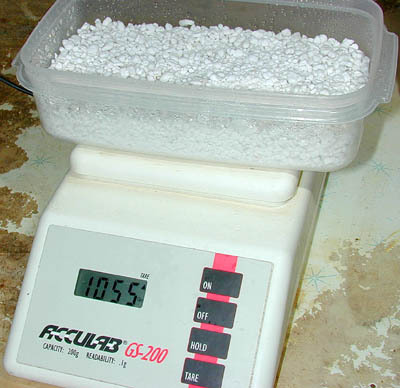 I incubate the eggs in a Perlite to water ratio of – 1 part Perlite to .8 parts water by weight. You will need a Digital scale to do this. 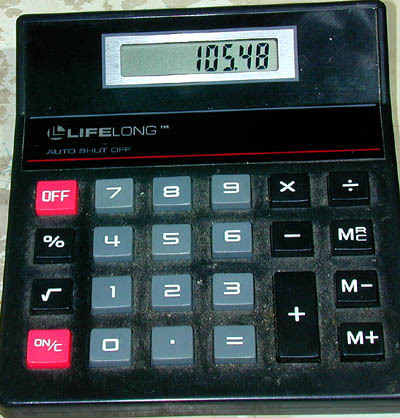 The model I use is an ACCULAB GS-200. It has a capacity of 200 grams, and a readability of .1 grams, which makes it pretty accurate. You do not have to have one that is this accurate, but it is helpful if you are able to tare out the scale. We will go into more of that soon. I purchased mine at Edmund Scientifics. This link should take you right to it. 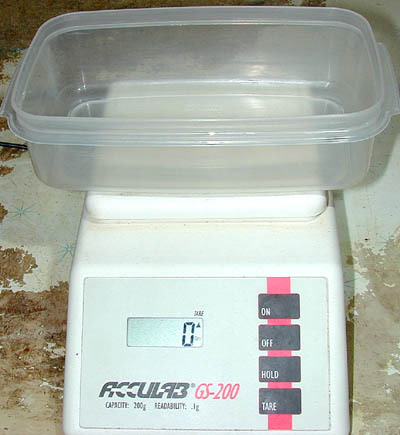 The picture below, shows the servin’ saver on the scale. We must tare out the scale to show zero weight. If your scale does not tare, you will need to weigh the servin' saver. This one weighs 61 grams. As you can see, it weighs 58.6 grams. If your scale does not tare, it will weigh 119.6. 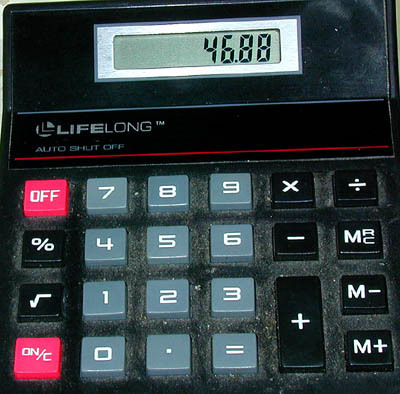 In that case you will have to subtract the weight of the servin' saver (61 grams), from the total to come up with the 58.6 weight. We will now multiply 58.6 grams times .8, and come up with a total of 46.88 grams. This is the amount of water that will be added to the Perlite. If we add 59.6 and 46.8 together, we will come up with 105.4 grams. When we start to add water to the Perlite, this is the figure we will end up with. If your scale does not tare, your total will be 166.4. I use a regular plant mister to hydrate the Perlite. I start at the top, and I mist all parts from top to bottom and then back and forth. I try to mist the whole top layer of Perlite evenly. I keep on doing it till the scale reaches 105.5 (or 166.4 if your scale doesn't tare). 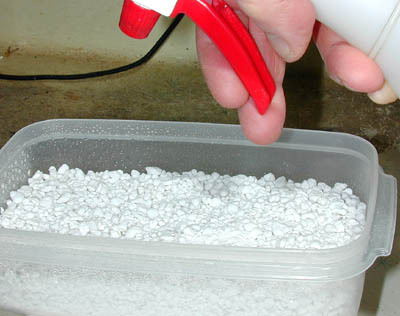 The water will sink down into the bottom layer of the Perlite, and will never need to be re-hydrated again. You are now ready to put your eggs in. I start at the top of the box and make sure they are tight enough so that four of them will fit across. I dig a small hole, and then put the egg in it. I then put a litle bit of the Perlite around the egg to ensure it doesn't move. You are now ready to cover them. I mark the kind of Eggs they are (in this case they are Carrot-tails), and mark the date the first eggs were laid. Since there are no holes in the servin' saver, once they have been hydrated they will never have to be done again. What I do is open the boxes once a week for air exchange, and then cover them back up. 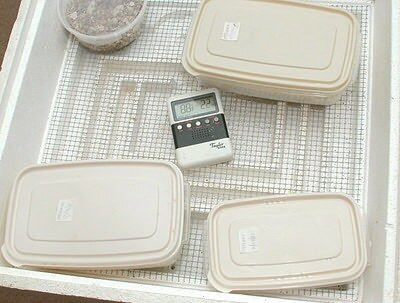 With this method, you do not have to add water to the incubator either. The Perlite will release the proper amount of humidity. 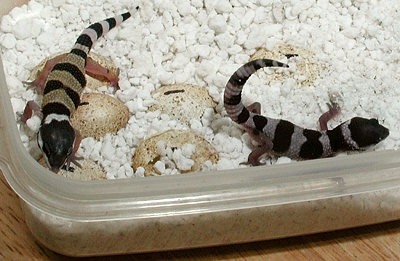 They are now ready to go into your incubator. 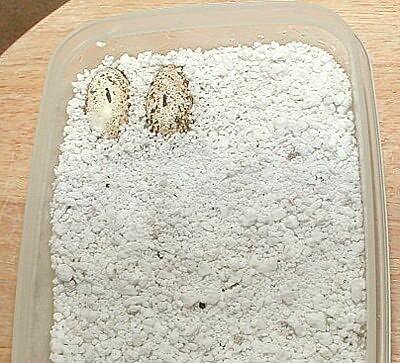 You may have noticed the black marks that are on top of the eggs. Let me tell you why I do this. Once an embryo has started to form in the egg, it is very important that it is not moved. If it is, it can literally drown in the egg. 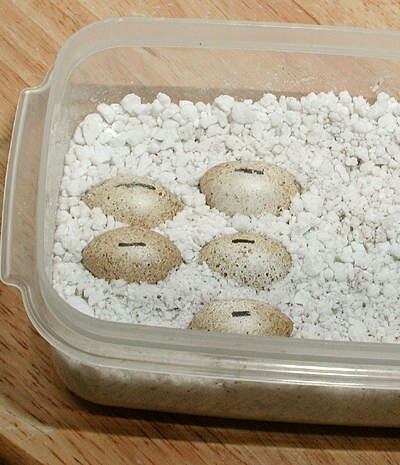 To make sure that this does not happen, last year I started to put a small mark on top of the eggs when I found them in the lay box. I use a black fine point Sharpie to do so. You can see the uncovered eggs in the picture below. This way, even if a new hatchling dislodged the egg from it’s original place in the incubation box, I would know which way to put it back in. The pictures below will show you what I mean. In this picture the new hatchlings have dug up the incubation box. 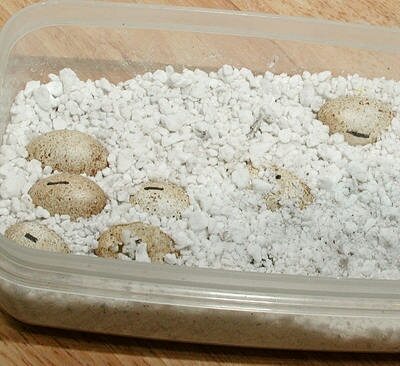 This picture shows what it looks like after I have removed the new hatchlings. Note that a few of the eggs are out of place, and have no marks on top. If they were left like this, the embryos inside of the misplaced eggs would surely drown. In this picture I have put the eggs back in the box, in the correct orientation. Hopefully I found them in time, and they all will hatch. Most of our eggs are incubated to be Females, so instead of using an incubator for them I just keep them on a shelf in the Reptile room. I keep the room at a temperature between 79 - 82 degrees, which is the perfect temperature to produce Females. To produce Males, I use Hova-Bator incubators. I set them to a temperature of 87 - 88 degrees, which is the perfect temperature to produce Males. The Hova-Bator that I use is the Standard View Thermal Air Flow Hova-Bator Model# 1602R. You cannot use the Turbo Fan model as the fan motor will generate too much heat. You will never be able to get the temperature lower than 95 degrees, which would kill your eggs. I have found that the Randall Burkey Company has the best prices on them. I use a digital thermometer to calibrate the Hova-Bator. 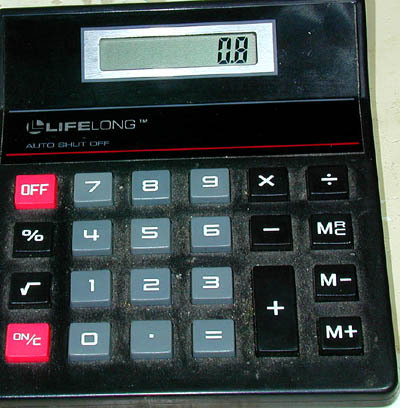 The one I use is a Taylor THERMO-HYGRO model 5368. One good thing about this model is that it gives you the Minumum and the Maximum temperature. You can also use the thermometer to calibrate for Females at a temperature between 80 - 82, or at a temperature of between 84 - 86 to produce a mix of both sexes. In the picture below I have the Minumum Temperature. 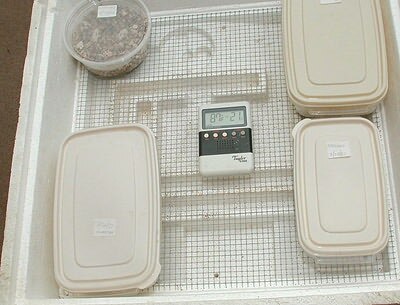 In this picture the incubator is at its highest temperature. In this picture it is the correct 87 degrees. I wish everybody a great breeding season.